This article details how to watch network television using over the air digital signals. For a more comprehensive guide on everything, you need to know about enjoying all the TV and movies you want without a cable TV subscription, check out my guide to watching TV without cable. Update: If you want to hear my account of what using a TV antenna entails, check out our TV Antenna episode of the Grounded Reason Podcast. It’s free! Click this link to listen on iTunes. If you don’t have an iOS device or iTunes installed on your PC check this show notes page for other options. Over the Air (OTA) TV signals are what many of us grew up watching before Pay TV convinced us all we needed cable. Did you know you can still OTA TV for free? Did you also know that broadcast TV signals are in crystal clear HD? Furthermore, it’s free! We can all watch local TV channels without cable, all you need is an OTA TV antenna and digital tuner. The majority of you already have a digital tuner built into your TV. Any television made after 2007 has a built-in digital tuner, as mandated by U.S. law. If your TV is older than 2007 and you aren’t ready to upgrade, you can look into getting a digital converter box. Before we continue, check if there is an antenna already on your roof. Find the cable coming off your roof, and locate where it comes in the house. Connect that cable to your TV and scan for channels. Be aware you should ensure the antenna is properly grounded. If you don’t have an antenna or need a better one, read on. Click on any of the topics below to navigate to that part of the article. When I chose our TV antenna I used the using this channel locator tool from Mohu. Ultimately, I went with the Mohu Sky 60 and my family loves it. However, different situations may require different TV antennas. This article will consider those variables and help you chose the best TV antenna for you or your family. First, you will need to get a signal report to see which channels are available to you. Signal power is one of the most important factors when choosing a TV antenna. To discover the signal power in your area use this great tool from tvfool.com. Once you enter your address, you should receive a signal report like the one below. 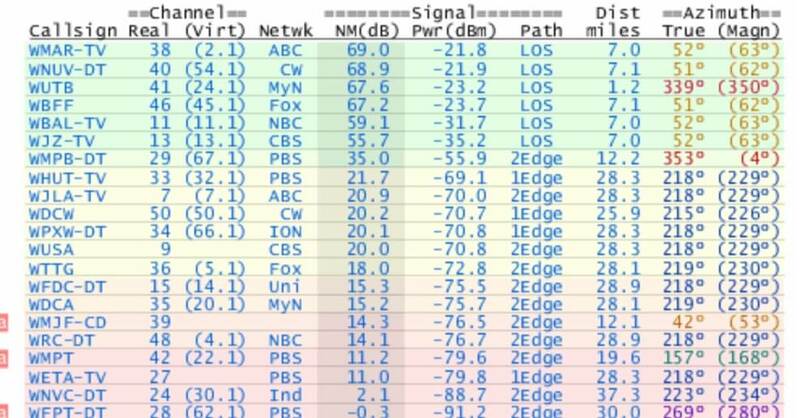 While the report is color-coded to see which channels require an indoor vs outdoor antenna, there are a number of factors that this color coding doesn’t address. I’ll go over the details of what this report means in this guide. However, I’ve put together an episode of the Grounded Reason Podcasts that walks you through using TV fool. For the purposes of this guide, you want to note the “Netwk” column. For every “must have” TV network in that column, write down the values below. Real TV Channel is in the “Real” column. The channel that you see on your TV is the virtual channel. Stations do this to keep their channel brand while broadcasting on a higher powered virtual channel. Noise Margin or NM (dB) is the amount of signal loss or attenuation the TV signal can withstand and still be received. Many things can cause signal loss and I cover that later in the article. The important thing to know is once the noise margin hits 0, the channel will not come in. “Dist miles” is the distance in miles your house is from that channels TV tower. The true direction of the station or the “True” column is the compass direction the TV tower is located. These values will help you pick the best TV antenna. Before covering my antenna recommendations there are a few things we should consider like indoor Vs outdoor, UHF\VHF, and the importance of direction and gain. An outdoor antenna will always be better at receiving TV channels than an indoor TV antenna. I always recommend going with an outdoor antenna when possible. However, you will usually be able to pick up a TV channel with an indoor antenna as long as the noise margin or NM (dB) column is greater than 40. That said, there is a reason I advise against blindly trusting the color-coding on TV fool. The biggest is the difference between UHF and VHF channels. TV channels are split on to three different bands. Channels 2-6 are on the VHF-Lo band. Channels 7-13 are on the VHF-Hi frequency, and channels 14-69 are on the UHF frequency. The majority of indoor TV antennas are designed to pick up UHF channels. Below is the chart from my TV fool that breaks down the spectrum. When it comes to indoor antennas, I’ve had the best luck with old fashioned rabbit ear antennas when it comes to receiving a VHF signal. This is due to requiring long pole elements to capture VHF signals. To make matters worse, many signals in today’s digital world interfere with channels in the VHF spectrum. However, I recently did a review of the new Mohu Leaf Glide, which excels at receiving both UHF and VHF channels. Generally, I recommend using an outdoor antenna if you are dependent on receiving VHF channels. Although, there are antenna hacks like using a UHF/VHF signal joiner to combine your UHF antenna with a pair of rabbit ears for VHF channels. 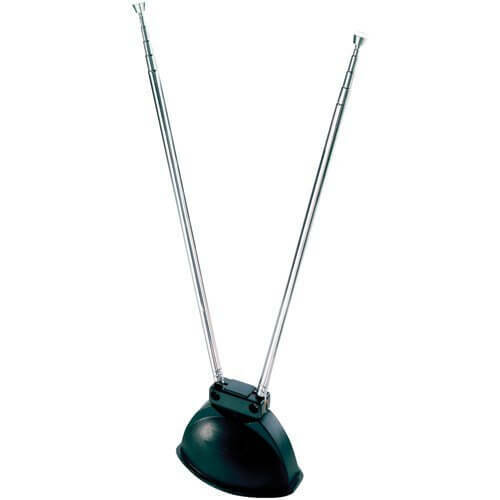 Directional TV antennas are antennas designed to pick up signals in the direction you point them. Omni-directional antennas are designed to pick up channels in all directions. This tradeoff off is done by focusing the antenna gain, which is different from amplifier gain. 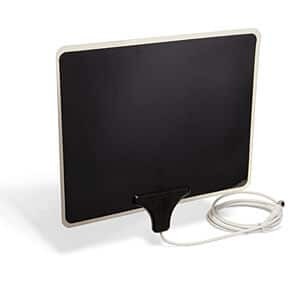 With a directional TV antenna, the gain is built into the TV antenna to focus reception in the direction. This gain is measured by adding the gain value of the antenna to the noise margin (NM db). For example, a channel with a noise margin of 30 in the TV Fool report can be read as 45 if you point a directional antenna with 15 dB gain toward it. Omnidirectional antennas balance their gain to pick up channels in all directions. Now that we have a general idea about the things that matter when it comes to antenna reception, we can get into the best antennas to consider for given situations. Of course, if you want to know more about concepts like noise margin, I go a bit more in depth later in this article. In this situation; you should be fine with an Omni-Directional indoor antenna. My favorite is the recently released Mohu Leaf Glide. It does a great job of pulling these channels. Antennas like the Mohu Curve older Mohu Leaf and the Winegard Flatwave are also good options. The Curve and Leaf are very similar in function. The choice here comes down to aesthetics. It’s possible for these solutions to work for VHF-Hi channels as well, given they are with no more than 10-15 miles away. They are both available to purchase directly from Mohu. In these situations, I recommend an outdoor antenna. The type of antenna really depends on the channel locations and the noise margin. If the UHF channels have noise margins are above 15, but are in multiple directions you can use an omnidirectional antenna like the Mohu Sky. It’s the one we use and it’s aesthetically pleasing to the eye. It’s also very easy to install and we get a couple of VHF-Hi channels with it. The noise margin also has to account for noise in the line (which I cover later in the article). A noise margin of 15 should be more than enough, but it’s possible you may need a bit more signal power. If you do need a bit more signal power and your channels are roughly in a 180-degree arc of one another, then the Channel Master ULTRATenna 60 (CM4221HD). It’s multidirectional as is casts a wide arc and even adds about 9 dB of gain to your noise margin. If you need a bit more gain you can get the ULTRATenna 80 which provides 12 dB gain. If you need a bit more gain you can give the Antennas Direct DB4e Ultra a try. While the arc on this antenna is about 60 degrees it packs a bit more gain at 15.8 dB. You can even get a bit more gain with the DB4e Extreme. It provides 17.4 dB of gain, but its reception arc is 28 degrees. This one is also a bit of a bear to install. 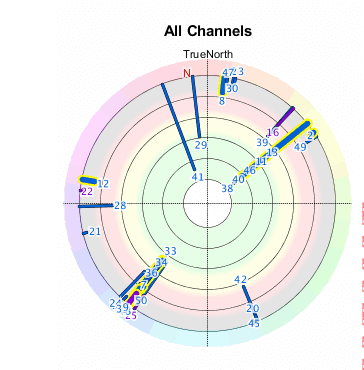 While I was able to get VHF-Hi channels with my Mohu Sky, not everyone will have the same experience due to interference patterns varying by location. If you are having issues receiving VHF-Hi channels there are antennas designed to do a decent job with both UHF and Hi-VHF channels. 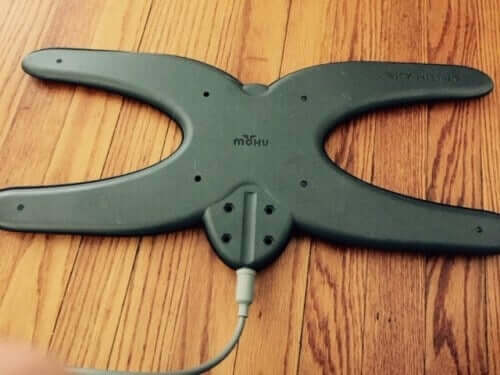 For an indoor antenna, I would go with the Mohu Leaf Glide. Check out my review of the Mohu Leaf Glide for more information. As for outdoor, the Antennas Direct Clearstream 2V is a good option. It pulls channels within a 70-degree arc and adds about 8 dB of gain to the noise margin. While Antennas Direct considers this an indoor/outdoor antenna, it’s a bit too bulky for me to consider this an indoor antenna. If you need a bit more power then try the upgraded Clearstream 4V. If you need a bit more antenna gain you can try the Winegard HD7694P. It requires more precise aiming than other antennas but will pull channels at long distances in the VHF-Hi spectrum. It offers a signal gain of between 10-13 dB depending on the channel you are trying to receive. Some areas of the country have digital channels in the VHF-Lo range. These are channels 2-6 in the “Real” column. If all the channels you want are within 45 miles then go with the Channel Master CM3016. For longer distance channels, I’d try the Winegard HD8200U. Now that you know the type of antenna you will need, I wanted to point you to more information on common questions that come up in regard to over the air television. Over the Air DVR – Yes, you can record from your antenna. In fact, I strongly recommend it and review several options in this guide to OTA DVRs. More than 1 TV – There are easy solutions for connecting an antenna to more than 1 TV. I recommend an outdoor antenna for this in most situations, but check out the link for more information. Grounding the Antenna – This isn’t a concern for an indoor antenna. However, you definitely want to ground an outdoor antenna. It will mitigate lightning strikes and other electrical anomalies that are possible, but unlikely. Reception – For those that don’t want to read all the details and inner workings of TV antennas, I’ve put together a quick reference to help improve indoor antenna reception. Antenna Installers – I’ve had many readers ask about antenna installers in their area. I’ve discovered a great service called Home Advisor that finds trusted home improvement professionals in your area. For those that want a bit more information on what the TV Fool report contains, I cover that in this section. Path – This is a description of the signal path from the tower to the TV antenna. The height placement will affect the type of path the antenna can receive. This is the last column under the “Signal” heading of the report. Below you will find the values found in the columns and their definition. LOS – This means Line of Sight. Basically, there is nothing in the way of the antenna and the tower. 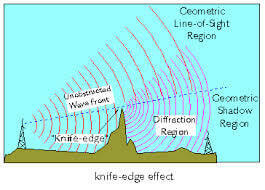 1Edge – When the signal leaves the tower it is “cut” when it hits a hill, mountain, or other well-defined obstruction. When this happens, the obstruction acts as a secondary, albeit weaker, source of signal generation. A value of 1Edge in the “Path” column indicates the antenna is receiving the signal after being cut by this obstruction. The picture below demonstrates this concept. 2Edge – This is the same concept as 1Edge, except the signal was cut twice before reaching the antenna. As you may have guessed, this results in a much weaker signal than 1Edge. Tropo – This is tropospheric scatter. Basically, the signal has been refracted by the high level of moisture in the upper troposphere. Let’s not worry about these as they wouldn’t be cost effective to capture. Noise Margin – This is the first column under the “Signal” heading of the report and is denoted by NM. This is the ratio by which the TV signal exceeds the minimum amount needed for proper operation, just before being picked up by an antenna. In order for the channel to be received, the noise margin needs to be above 0 when it reaches your TV. I recommend 10 dB to account for weather and other anomalies. TV – There is typically a dB loss associated with the TV. An estimate of 3 dB should suffice. Cable runs – Typically RG-6 coax is used in the US. The maximum DB loss in the highest TV frequency is about 5.6 dB per 100 ft. cable run. Add a .5 dB loss for any un-split joint connection. Splitters – Every split of the coax cable running from the antenna to a TV incurs the loss listed on the splitter. This is typically 3.5 dB, but to be sure, it should be listed on the splitter. You have to count every output on the splitter whether it’s used or not. I go into more detail in this post on choosing a coaxial signal splitter. Adjacent House –An adjacent house in line with the generation of the signal and casting a shadow either on the antenna or on the exterior wall that is in the path of an indoor antenna creates a loss. Various studies show a dB loss between 10-21 dB for signals within UHF and VHF frequency. Studies also show that raising the height of an indoor antenna will lessen the loss. Tree Shadowing – This is when a nearby tree in line with the generation of the signal casts a shadow on the antenna or on the exterior wall in line with the antenna. Trees have been shown in studies to have a dB loss of 0-10 dB within the UHF and VHF frequency. A TV antenna installed at a lower height can improve signal propagation since the signal can better avoid the tree canopy. In rare cases raising an antenna can actually degrade reception. Often in these cases, a dense tree canopy can be blamed. Home Penetration – This only matters for an indoor antenna. Expect a loss of around 14dB for a signal to penetrate a home and reach a first-floor antenna. Installing the antenna on the 2nd or 3rd floor can greatly mitigate a portion of these losses. Anything else with a quantifiable decibel (dB) loss – Yes this is vague, but any nearby obstruction can cause a dB loss. To figure out if we can use an Indoor Antenna, we will first figure out the available Noise Margin after estimating the dB loss using the information above. To do this, locate the NM field and find the lowest number for all the stations you require. Locate the bulls-eye chart to the left of the table pictured below. Figure out where your antenna will be mounted in relation to that tower. Optimally it will be near the exterior wall closest to the tower. If this is the case, only subtract 14 dB for home penetration; otherwise, subtract around 34 dBs to account for your house shadowing the signal. If the adjacent house is in the direction of the tower and casts a shadow on the antenna subtract another 20. If you are left with about 12 dB or more after subtracting loss estimates, you should have enough of a signal to watch OTA TV. If you are below 12db try and find a higher area to mount the antenna. This may be an upper floor or even the attic. You may want to consider the roof if possible. You can rerun the TV Fool report from a new height to test if it improves the signal. If there is enough noise margin on the weakest signal, the next consideration is the distance of the antenna from the tower. An important variable when considering the distance is whether the signal frequency is VHF vs UHF. Commercial antennas typically indicate the range at which they can capture a signal. It is a bit misleading as they usually specify the distance for Ultra High Frequency (UHF). UHF frequency runs at a higher frequency than VHF or “Very High Frequency”. Truth be told, there is little an indoor commercial antenna will do to pick up VHF that can’t be done with just a pair of rabbit ears. Typically your VHF channels should be within 15 miles, and your UHF should be within 30 miles for an indoor solution to work. This is extremely dependent on how much loss the signal takes before reaching your antenna. I have seen indoor antennas work over 50 miles from the broadcast tower. The last concept we need to consider is the direction. We may or may not need this information depending on the antenna type, but it’s important to know in the event we need to troubleshoot the signal. To figure this out refer to the channel table report once more. Now we are looking under the “Azimuth” header. Find the number under magnetic (Magn). Note the number next to each. It’s also handy to circle the channels appearing on the bulls-eye for ease of reference. Now we have everything we need to know about the signal. We can now cover the types of antennas available and their strengths and weaknesses. This subject can be confusing as there are really two types of gain in relation to antennas. There is antenna gain, which we discussed earlier as being inherent to the antenna. It essentially aids you in receiving a signal from the tower and can be added to your noise margin. Then there is amplifier gain, which is added from a powered amplifier. This amplifier will not impact the antenna’s ability to actually receive the signal but will mitigate noise created by splitters, cable length, and tuners between the antenna and your television. Passive vs Active Antennas – An active TV antenna is an antenna that has a powered signal amplifier. 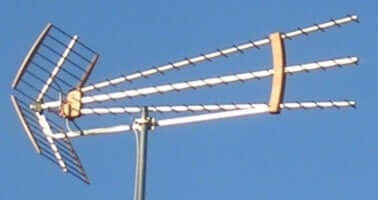 This is opposed to a passive TV antenna, which is without signal amplification. Active antennas will not affect the antenna’s ability to pick up a signal. However, it will boost a signal that reaches your antenna to overcome noise in the line, splitters and TV tuner. This “boost” is given in terms of a dB gain. Please note that an amplifier also adds noise that will impact the gain of the amplifier. There are also instances where an amplifier will provide no real benefit. For instance, let’s assume all the channels received hit the antenna with 30 dB of noise margin to spare. That’s already plenty to overcome most coaxial runs to the TV, hence no need for an amplifier. This brings up another important point. Clean up your coaxial runs. Older antenna and cable TV installations used RG-59 coaxial cable. That has almost double the dB loss of the RG-6 used in modern installations. If using splitters, be sure they are rated at least 5-1000mhz. Remember that signal strength is divided by the number of outputs on the splitter, whether they are used or not. A splitter causes a 3.5 dB connection loss on each output. Before wrapping this up I wanted to give a high-level overview of various antenna types. It’s important to understand that directional antennas will have a better range, but for typical indoor and outdoor home antennas, I would stick with the ease and convenience of an omnidirectional antenna if at all possible. Flat– This is the aesthetically pleasing antenna pictured below. They are easy on the eyes. They work well with UHF signals, and they are about equal to a pair of rabbit ears for VHF. Stylish- Companies like Mohu have introduced aesthetically pleasing indoor antennas like the Mohu Curve. 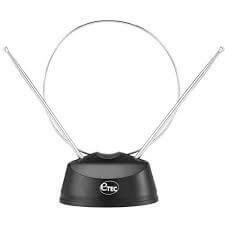 I’ve used it myself and it’s one of my favorite indoor TV antennas. For a stylish outdoor antenna that does a good job in the UHF and VHF spectrum, I recommend the Mohu Sky pictured below. It’s the antenna we use and we love it. It’s available on Mohu’s website. 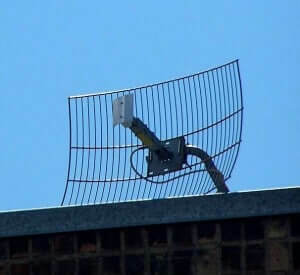 Grid Antenna – These antennae are intended to direct the antenna gain to a beam width not typically exceeding 25 degrees. These are perfect for those areas where TV towers tend to be in one direction. Yagi Antenna – These are my favorite directional antenna. The beam width can vary from 30 – 80 degrees but packs a lot of antenna gain. These are great for capturing hard to reach towers at long distances, but will also pick up nearby stations that aren’t in the direction you are aiming. These antennas still work fine for stations close by. If you live in a metro area with lots of signals close by, you could give one of these dinosaurs a shot. Loop – A loop is an omnidirectional antenna and is shown in the picture below. This antenna also contains a pair of rabbit ears. The loop is mainly designed to pick up UHF. Dipole Antenna – For TV antennas, these omnidirectional antennas are typically referred to as “rabbit ears”. They work for local VFH signals, but not much else. 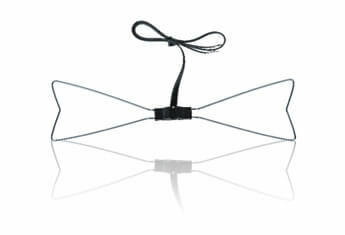 Bow Tie – The bow tie antenna is pictured below. It’s omnidirectional and can pull VHF and UHF. The bow tie underperforms on UHF compared to the loop antenna, and doesn’t hold up to rabbit ears for VHF.